Zito likes to "to get out there and paint." Gallery Bar on the LES, as the name implies, can't seem to make up its mind. And weekends from now until September 7, it'll go you one better and triple as a studio. The artist Zito, whose collection of portraits called "Multiple Personalities" currently hangs in the gallery, will be on hand painting at the space on Friday and Saturday nights and Sunday afternoons throughout the duration of the show. Zito, whose quick-draw portraits can be a kind of performance, says the idea came about naturally. "I like to get out there and paint in public and involve the community," he says. In addition to painting watercolor portraits on paper (for which a $100 donation is suggested), Zito is also painting with acrylic on found objects that people walk into Gallery Bar with. At the opening, he painted portraits on a program from the play "Jesus Christ Superstar" (it takes a special person to ask to see his head superimposed on an image of Christ), a fan, a mirror, and a washboard. The watercolors and various painted-on ephemera become a part of the show for the duration, so the "Personalities" coninue to evolve. Earlier this summer, Zito's public painting had a slightly larger audience. He was a part of Central Park's Summer Stage and painted Q-Tip's portrait from the side of the stage as the rapper performed. The crowds at Gallery Bar aren't as quite as large as those at Central Park, and though Zito can finish a watercolor in as little 10 or 15 minutes, there were still people waiting to get their portraits painted at 2 a.m. when the artist decided to call it a night at the opening. That's nothing, though. 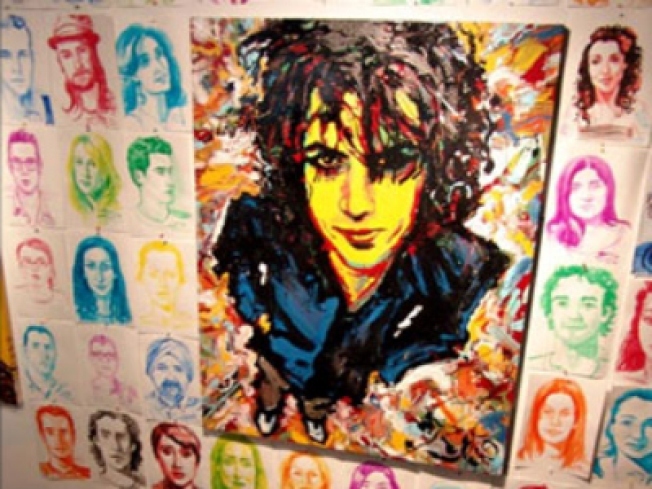 Zito once did a gallery show where he painted portraits for 40 hours straight without sleeping. Zito likes to work on commission, but has had some unconventional ones. A portrait he did did of the actor Lee Marvin -- which Jarmusch commissioned for the film -- appeared in a segment of Jim Jarmusch's "Coffee and Cigarettes." Zito met Jarmusch through the director's brother when Zito worked booking gigs out of CBGB'c and Jarmusch's brother was a projectionist who worked with some of the local bands. The Lee Marvin painting hangs behind Jack and Meg White of the White Stripes in a sequence of "Coffee and Cigarettes." Jack White frying a Tesla coil just below one of their paintings is an honor bestowed on few artists. And it's on film, no less.